The city's decision to turn the Atlantic Yards project over to the Empire State Development Corporation (ESDC) means that ESDC can override zoning that limits the height and bulk of the 16 towers planned. But let's not forget the zoning that regulates arena locations, as Develop Don't Destroy Brooklyn and the Council of Brooklyn Neighborhoods (CBN) point out. 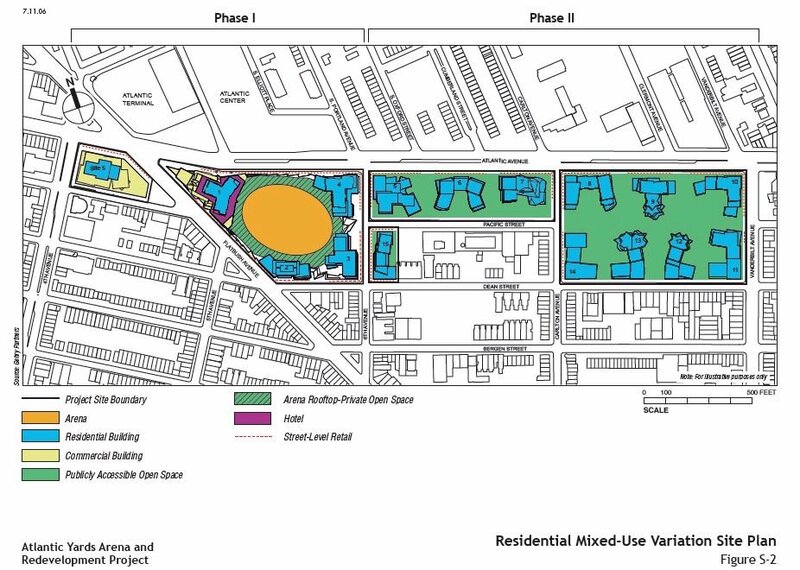 The New York City Zoning Resolution prohibits arenas within 200 feet of residential districts as some of the operations could be incompatible with districts limited primarily to residential use. (Arenas are permitted in most commercial districts allowing for residential use.) The arena block is adjacent to a residential district to the south, and accordingly, the arena has been designed to minimize its presence and effect on the residential uses on these blocks. Primary entrances and signage would be oriented toward the crossroads of two major commercial thoroughfares and away from these residences. Two primarily residential buildings (Buildings 2 and 3) on the arena block would occupy most of the Dean Street frontage, serving as a buffer between uses. It probably depends on who's doing the considering. 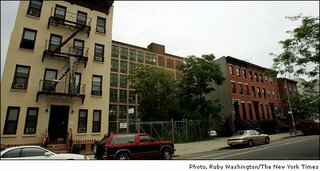 Note that the photo above, from the New York Times, depicts the north side of Dean Street, which would be demolished for the new buildings. The south side is similar. • The City zoning policy prohibits arenas within 200 feet of residential district. The DEIS states that the arena is designed in such a way that it addresses the City zoning policy’s objective make an arena use compatible with residential uses. However, the design isolates the arena and reinforces it as a separate enclave. Although there are limited design measures that could make arena compatible, there is no attempt to connect it with the surrounding area. • In order to understand the true effect of an urban arena, other examples from different cities should be referenced in the DEIS. Based on preliminary analysis, there are no urban arenas 200 ft or less from residential neighborhoods that are positive examples.